Heleen Vollers and Jorn Berends of the European Data Portal project visited the Knowledge Center Open Data on July 3rd. Together with a group of Geomatics students we discussed the need for data portals, the experiences of the students with data portals and reviewed the European Data Portal. Bastiaan van Loenen presented research performed by the students in 2016. In their assessment on geoportals and open data portals most striking finding was the amount of broken links. Further most portals have a non-intuitive unique interface. 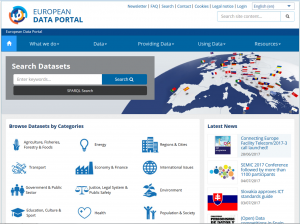 Jorn Berends introduced and demo-d the European Data Portal. Discussed topics were, among others: which user (group) should the portal satisfy, how to select a dataset from a list of 800 similar ones, role of blockchain to improve the user friendliness, the role of authentic data, and the possibility for non-government organisations to add data to the portal.